DESIGNED BY A WISH COME TRUE. OUR MODEL IS WEARING A SMALL. Prefer paper? Download printable order form for emailing or faxing. You have 7 working days to return an item from the date you received it. Only return items that have been purchased directly from us. For purchased returns, call us at (972) 400-1282. Please note we charge a 10% restocking fee. For returning rental items, see our Rental Agreement page. TOTAL QUANTITY: 40 SHEER BLACK OPEN SKIRT. COIN SCARF CAN DRAPE BUST OR WAISTLINE. THERE ARE ROYAL BLUE, PINK, PURPLE, GREEN, TEAL, LIGHT BLUE, AND YELLOW SCARFS. WRIST COINS NOT INCLUDED. TOTAL QUANTITY: 49 AVAILABLE SIZES: BIKETARD: 5 X-SMALL 14 SMALL 21 MEDIUM 9 LARGE PANT: 5 X-SMALL 15 SMALL 22 MEDIUM 7 LARGE TEAL OUTFIT HAS BIKETARD, TOP FRONT IS FULL OF SEQUINS WITH DOUBLE SNAP CLOSURE WITH SMALL KEY HOLE BACK. GOLD COIN DETAIL BELOW BUST LINE HAS BEEN REMOVED, BUT THE GOLD BRAID IS STILL INTACT. GAUCHO PANTS ARE SHEER WITH LARGE SIDE LEG OPENINGS AND ATTACHED SEQUIN AND GOLD COINED DETAILED BELT. TWO PART SHEER HEAD PIECE WITH GOLD COINED AND SEQUINED DETAILING. BY SPARKLE. 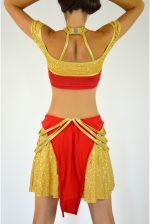 TOTAL QUANTITY:12 BOLLYWOOD SET WITH COLORED SASH WITH SILVER COINS, AND SHEER BLACK PANTS WITH ELASTIC ANKLES. BY CUSTOM DANCE WEAR. GREAT TO MIX WITH DPHS26. PLEASE SPECIFY COLOR OF SASH WHEN ORDERING. TOTAL QUANTITY: 96 COLLAR: 9 X-SMALL 45 SMALL 37 MEDIUM 15 LARGE 3 X-LARGE DRESS: 9 X-SMALL 44 SMALL 31 MEDIUM 8 LARGE 4 X-LARGE PRICE REMAINS THE SAME, WHETHER THE SET OR ONE PIECE IS RENTED. BLACK AND METALLIC TURQUOISE SNAKESKIN HALTER DRESS WITH FITTED BODICE AND FLARED SKIRT. HAS A TULLE LAYER AND BUILT-IN SHORTS. COMES WITH A BLACK COLLAR AND PUFFY SLEEVE. LARGE TEAM SET; YOUTH AND PLUS SIZES AVAILABLE. TOTAL QUANTITY: 35 AVAILABLE SIZES: 2 CHILD X-LARGE 7 SMALL 15 MEDIUM 10 LARGE 1 X-LARGE BLACK VELVET HALTER DRESS WITH TWO SLITS ON SIDES WITH PINK SPARKLE BIKETARD AND BUILT IN BRA. HEADBAND NOT INCLUDED. LARGE TEAM SET; YOUTH AND PLUS SIZES AVAILABLE. TOTAL QUANTITY: 43 AVAILABLE SIZES: 1 X-SMALL 11 SMALL 26 MEDIUM 4 LARGE 1 X-LARGE FOREST GREEN AND BLACK WATERCOLOR DRESS WITH GREY TULLE SKIRT WITH SPARKLES AND CROSSING STRAPS. BUILT-IN MATCHING GREEN AND BLACK WATERCOLOR BIKETARD. MADE BY MARCEA ACTIVEWEAR. TOTAL QUANTITY: 71 SIZES AVAILABLE: LEOTARD: 2 X-SMALL. 20 SMALL, 37 MEDIUM, 11 LARGE, 4 X-LARGE SKIRT: 3 CHILD X-LARGE, 36 SMALL, 28 MEDIUM, 4 LARGE PURPLE AND BLACK METALLIC LEOTARD WITH BLACK MESH OVERLAY ON FRONT, BLACK LACE-UP SIDE WITH RHINESTONE ACCENTS. RUFFLE SKIRT. BLACK WRIST GLOVES NOT INCLUDED. LARGE TEAM SET; PLUS SIZES AVAILABLE. Rental orders require a $100 minimum purchase. Prefer a paper order form? Download a printable order form for emailing or faxing.